Mailbox Monday has returned home to Mailbox Monday’s site this year. Two books in my mailbox this past week. One for review, one a wishlist book from Paperbackswap. Marley’s quiet. Innocent. Sheltered. Growing up in Northern California with all the privilege Rachel never had, what does Marley know about taking care of herself? About being okay? Rachel might not know her daughter at all. But she does know that she needs to find Marley before someone else does. Someone dangerous. The police have limited resources devoted to runaways. 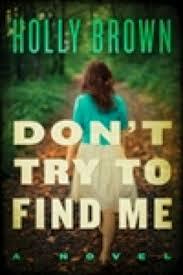 If Rachel and her husband, Paul, want their daughter back, they’ll have to find her themselves. Paul turns to Facebook and Twitter and launches FindMarley.com. But Marley isn’t the only one with something to hide. Paul’s social media campaign generates national attention, and the public scrutiny could expose Rachel’s darkest secrets. When she blows a television interview, the dirty speculation begins. Is Marley out there, somewhere, watching it all happen … or is the truth something far worse? When he resigned in June 2010, Justice John Paul Stevens was the third-longest-serving Supreme Court justice in American history. As a lawyer and on the Court, he worked with five chief justices – Fred Vinson, Earl Warren, Warren Burger, William Rehnquist, and John Roberts. 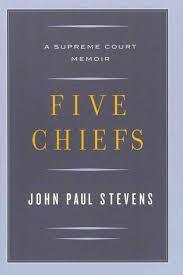 Five Chiefs is his account of the workings of the Court from his personal experiences with these chief justices: as a law clerk during Vinson’s tenure, a practicing lawyer when Warren was chief, a circuit judge and junior justice during Burger’s term, a contemporary colleague of Rehnquist’s, and a colleague of the current chief justice, John Roberts. The chief justice of the United States has often been described as the “first among equals.” Known and deeply respected for his candor, Stevens discusses his views of these men and his own career, from his law school days until the moment he left the bench. He includes fascinating information about the Court and about many of the most complex and controversial decisions he was involved with – including cases dealing with freedom of speech, affirmative action, capital punishment, and sovereign immunity. And he explores the human side of life at the Court, along the way revealing, among other things, why having a good backhand might get someone a clerkship and the legal impact of moving a conference room table. Written with humility and grace, Five Chiefs is an unprecedented and historically significant look at the highest court in the United States. I would read both of those (if I could find the time, of course).